During her drawing phase, Cai Yan can forfeit drawing and discard her entire hand. If she does this, she is immune to all damage until her next turn. She must have a hand to do this. Cai Yan can use any heart as a peach for herself. 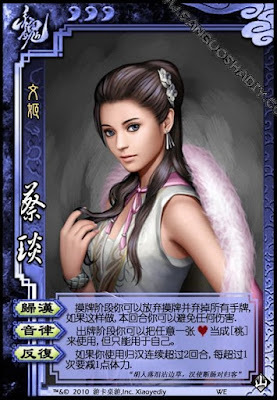 When Cai Yan uses Return Home three turns in a row, she loses one blood. Cai Yan must have a hand to use "Return Home". "Temperament" cannot be used to save anyone else. It is only for herself.